You may want to describe the reason why the rules are setup in the way they are in a Decision Table. You can do this by editing the description of rules added in a Decision Table. 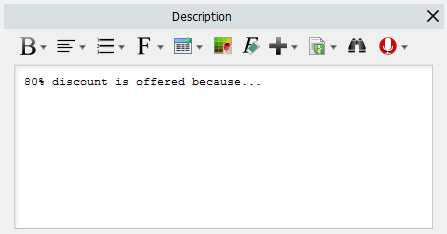 Besides rules, you can also edit the description of conditions and actions. 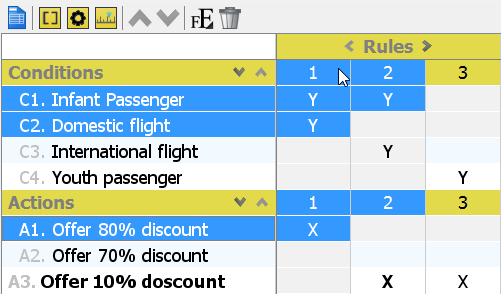 Select the desired rule in the Decision Table. Click the Show Description button at the right hand side of the status bar to show the Description pane. Edit the description in the Description pane. Dog ear icons are shown in rules, conditions and actions that have description. You can read the description by selecting a rule/condition/action and viewing the Description pane. When two or more rules in a Decision Table are form with the same set of conditions, they are said to be conflicted. You will see an exclamation mark near those conflicted rules. It is recommended to resolve the conflicts to avoid ambiguity.